King Edward VII and his elegant wife Queen Alexandra led English society to new taste levels so sophistication and elegance became the definitive style of this period. Edwardian jewels reflected gracious delicacy with ribbons, bows, swags and tassels, decorated décolletè dresses of lace, embroidery and fringe of pale hues. Toward the end of the 19th century, diamonds were found in quantity in South Africa. Quantities of platinum were also discovered in Kimberly, South Africa early in the 20th century and it became the favored metal for this period's diamond jewelry. Its malleability and strength made working intricate, pierced open-work into the metal much easier than did gold. 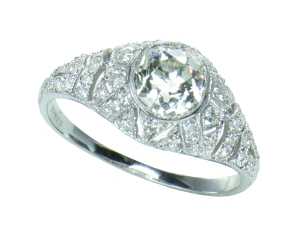 Platinum also retained a high degree of reflectivity and luminosity giving this period's jewelry its own special beauty.